Since the beginning of time society has always been a voice in what the perfect woman should look like. Believe in Yourself Project is an American nonprofit charity organization whose mission and purpose is to give young women a self-worth and help rebuild their self -esteem. 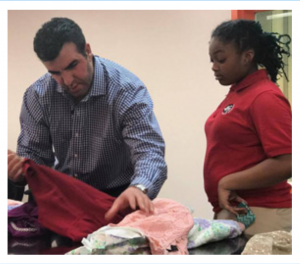 By implementing this mission it provides new, and unused designer dresses to young women who are unable to afford dresses to certain school functions, such as proms/homecomings, father and daughter dances, and weddings. For example just in November 2016 as the holidays were approaching many dresses were donated to the Boys and Girls Club of Washington DC. Founded by UsTrendy founder Sam Sisakhti, this Boston native was able to observe and focus on the epidemic in how cyber bullying, body shaming, and trying to fit in portrays a huge impact in many young women lives. It was during this observation Sam came up with the ‘Believe in Yourself Project.’ Realizing the type of innovator Sam is, his concept and mission is to help promote positive body image for underprivledged females starting at a very young age. UsTrendy allows aspiring fashion designers to upload their portfolio and sell their fashion on the website. Featured in Boston Magazine as one of the Most Promising innovator, Forbes, Vogue UK, as well as BizJournals.com, Stuff Magazine for Indie Fashion just to name a few, it is easy to tell that Sam is an entrepreneur on a huge mission and making a huge impact in society. The goal of ‘Believe in Yourself Project’ as of December 31, 2016 is to be able to donate between 5000 to 10,000 dresses this year. Providing positive images and feedback for young women, Mr. Sisakhti has incorporated both UsTrendy and the Believe in Yourself Project to work hand in hand. By doing so it will allow independent designers to donate dresses to young females who are faced with adversity. With UsTrendy and the Believe in Yourself Project it is clearly easy to tell that Sam is an entrepreneur who really has a passion not just for fashion but helping people.